Wetsuit socks provide extra warmth in the water and offer protection and comfort under foot when walking on the sand or sea bed. 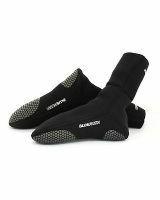 These wetsuit socks are available in a range of sizes. These socks are very stretchy so fit well. Our Blue Rush wetsuit socks are manufactured to a high standard. They are made from 3mm neoprene and have flat locked stitching for strength in the seams and a latex sole for additional grip and strength.